There are two strong vertical elements in my new painting - Moonlit Cove. The Moon and it's glowing reflection seem to be highlighting one thing, while the Cape Hatteras Light is a beacon of hope in the darkness drawing your attention to the right. It's not supposed to be "correct" to have "two" things going on in a painting, but let me tie them together. In the ebb and flow of life, good and bad are constantly washing ashore. Some days you find treasures and some days you find trash. It is just the way it is in this world, and sometimes it makes you go crazy. "Can't we ever get a break?" we might ask, as the storms of life bring in more wreckage. 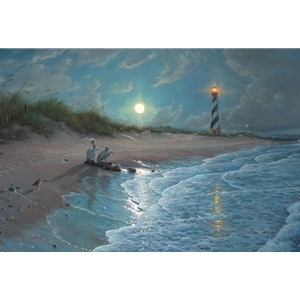 Or maybe, "Wouldn't it be nice to be able to sit here forever and soak in the beauty of this moon and light house?" It is not very often when things are great - maybe even perfect - in my life. When they are, I will look at Bonnie and say "Wow, this is nice -- but I wonder how long this will last?" Do you wonder when the next thing will come in on the crashing waves of life? Well, know this when you do - Such is life! It is good and it is bad. It is the best of times and the worst of times. Even on a beautiful evening such as this, there is always something lurking in the darkness which wants to overwhelm you and to make you afraid. However, there is a light that is constant -- standing out in the storm -- pointing the way. So keep your eyes on what is light and truth - the Way - seek it out and you will find rest on the shores of life and will find beauty in the darkness all around.